The Week Without Violence (WWV) is a global campaign to end violence against women. The campaign occurs in the third week of October, each year. Since 1999, the northern metropolitan region has had a proud history of participation in the WWV, primarily through the Clothesline Project, which focuses on raising awareness about family violence. 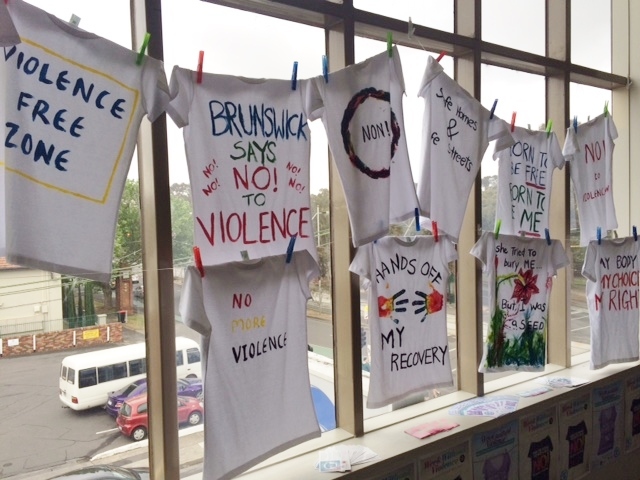 In October 2018, almost 50 organisations in the northern metropolitan region organised WWV activities, with the majority facilitating a Clothesline Project activity. Activities are often run in group settings or through displays. In the northern region, the WWV is coordinated and resourced by Women’s Health In the North. 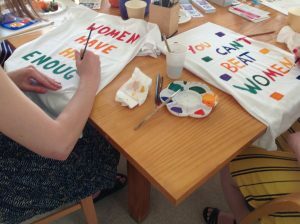 The Clothesline Project is a popular WWV activity for women and their supporters to participate in. The concept is simple: each participant expresses their feelings about family violence, using words and/or artwork to paint on a T-shirt. Once finished, the participant hangs the T-shirt on a clothesline. The clotheslines are then displayed in organisations and public spaces throughout the region. A paper T-shirt template is available. Find out more about what participants can paint on their T-shirt. Family violence is serious, prevalent and preventable. Family violence is a crime that is overwhelmingly perpetrated by men against women and children. It is both a cause and consequence of gender inequality. 1 in 3 Australian women over the age of 15 has experienced physical or sexual violence and/or emotional abuse by an intimate partner. Download the Week Without Violence poster. The poster includes a space where local events can be promoted. What does a campaign involve? How: Become a campaign facilitator and host an activity. What: Organise an activity in your organisation or community. Where: Find further information about approaches in Group Settings and Display Settings. The Week Without Violence is an initiative created by YWCA USA in 1995. Over the past two decades, organisations around the world have hosted community events to end violence against women. Activities focus on raising awareness, promoting attitude change and enabling individuals and organisations to begin positive actions towards ending violence in their communities. In 1990 a coalition of women’s groups in Massachusetts, USA, developed a program to break the silence and bear witness to the prevalence of violence against women. allow those who are still suffering in silence to understand that they are not alone.